This Nothing Bundt Cakes Lemon Cake Copycat recipe tastes just like the original! A sweet, tart cake with an AMAZING cream cheese frosting. 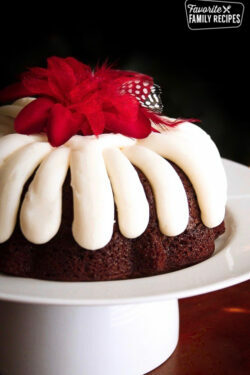 Nothing Bundt Cakes are a dense, rich, moist cake with a thick cream cheese frosting. Sometimes I frost this cake like the store as seen here on our Chocolate Chocolate Chip Cake. This looks pretty, but I always feel like someone gets short changed if they don’t get the big blob of frosting on their slice. To prevent this, I sometimes frost the whole cake as pictured above. There is always plenty of frosting and I pile the extra in the middle so there is added frosting on each piece when I slice it. Because of the richness of Nothing Bundt Cake’s Lemon Cake, one bundt cake can easily serve 15-20 people. 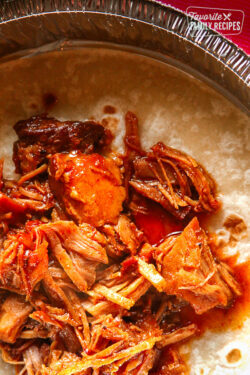 It saves in the refrigerator for several days if you have leftovers. The cake can also be frozen and then thawed in the refrigerator before it is frosted. Make sure it is wrapped in plastic wrap and then in foil before freezing to maintain the moisture and texture of the cake. Sometimes it can be a bit of a trick to remove the cake from the bundt pan after it is baked. To remove the cake easily from the pan after it has cooled, run a knife around the outer and inner edges of the cake (between the cake and the pan). Place the plate or stand you will be using to hold the cake upside down on top of the bundt pan. Gently hold the bundt pan and plate together as you flip them both right side up. The cake may pop out of the pan as you are flipping, but if it does not leave the cake pan upside down on top of the plate. Gently tap around the top of the pan with the handle end of a butter knife. This will loosen the cake from the sides and it should easily come out onto the plate. If not, flip the platter and bundt pan over again and start over by running the knife around the edges of the pan. Nothing Bundt Cake Carrot Cake – I found a new way to use all of the same ingredients, including the ease of a cake mix, yet give the cake a lighter texture that is similar to the Nothing Bundt Cake texture. Nothing Bundt Cake White Chocolate Raspberry Cake – White chocolate chips and a raspberry filling give this cake so much flavor! Nothing Bundt Cake Pumpkin Chocolate Chip Cake – A rich and moist pumpkin cake that is perfect for the holidays. Nothing Bundt Cakes Chocolate Chocolate Chip Cake– This Bundt Cake is rich, moist, and delicious! Our recipe tastes just like the cake you can get at the shop. Using an electric mixer, beat the cake mix, pudding, sour cream, eggs, oil, lemon juice, and water for 2 minutes. If using white chocolate chips, chop the chips into smaller pieces and add to the cake batter. Pour cake batter into a greased Bundt cake pan (nonstick cooking spray works best). Remove the cake from the bundt pan and place it on a serving plate or cake stand. See post above for details on how to easily do this. Wrap the cake well with plastic wrap and let it sit in the refrigerator overnight before frosting and serving. In a medium bowl or mixer, combine the cream cheese and butter until smooth and creamy. Mix in the vanilla, then gradually add the powdered sugar. Start with 2 cups and then keep adding until the frosting is nice and thick. 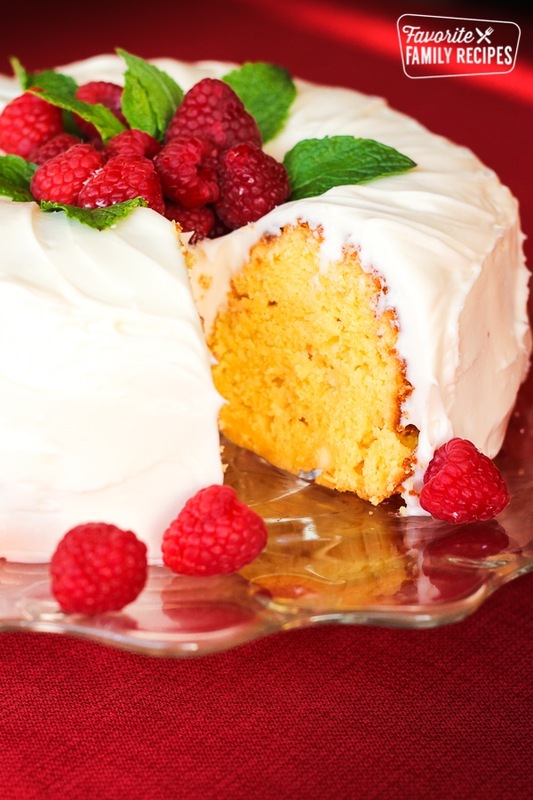 Frost the bundt cake and garnish with raspberries and mint leaves. Sounds & looks incredible! Are you using the ‘new size’ cake mix – which is like 15. ‘something’ ounces? I know the frosting is very delicious, but I’ll just drizzle it with a “Lemon Glaze”, in or to keep down the calories. I made the chocolate “nothing but bundt” cake, and it was delicious! My daughter-in-law, an artist, frosted it for me though! So glad you liked it!!! If you can, a pic and tag us on Instagram @favoritefamilyrecipes , we would love to see a picture of her creation! I am so sorry that this cake didn’t turn out for you, Patricia! A couple of things that can cause cakes to shrink are too much liquid and quick temperature changes. If you add any additional liquid like food coloring or extra lemon juice that can cause the chemistry of the cake to be off. Also, if your kitchen is too cold and the cake comes directly from the hot oven to the cold kitchen, that can cause it to fall as well. Altitude can also affect how recipes turn out in different regions. I hope this helps! I love the Nothing but Bundt cakes Lemon. I’m so exited to try this one!!!!! Can this recipe be used to make in a 9×13 pan if I don’t have a bundt pan? We haven’t tried it that way before but I am sure it would work. If you try it, let us know how it turns out! I followed this recipe to the tea and was pleased with the out come, we visit Nothing Bundt Cake kinda often and lemon is one of my favorite flavors. Job well done. Just made the lemon version for Father’s Day. followed the recipe exactly. Tasted great and was a hit. Any tricks on getting the cake itself a little lighter – seemed heavy? I used a Betty Crocker lemon cake mix. Recommendations on a better cake mix? I cannot, for the life of me, figure out your method for getting the cake out of the bundt pan. I would love it if you would post a video or at least a couple of pictures showing the method. I understand the part about running the knife around the inside edges between the cake and the pan but the upside down plate portion of the description just doesn’t make any picture for me that will give me the cake on the plate correctly! LOVE the idea of posting a video… we are putting it on the “to-do” list. We have dozens of videos right now but none of our bundt cakes yet. The most important part is getting the pan greased and floured. Are you talking about the part where you flip the cake on to a plate? Just wondering….. the recipe didn’t say anything about the flour after greasing, but you mentioned it here. If so, how much flour do you use? Oh sorry, it must have been in the raspberry bundt cake recipe. I like to grease the pan and lightly flour (shaking out any excess into the sink, hitting the sides of the pan so there is a really light flour coating). I usually use butter to lightly grease but you can use cooking spray and then flour. Does that make sense? I ONLY use Crisco (shortening) to grease pans if I plan on removing the cake for presentation. Use a piece of waxed paper and really get the shortening in there …every single nook and cranny. Follow it with flour. Don’t even think about cooking spray. I started using shortening when I first made a lamb mold cake (where it is really, really necessary due to the complexity of the mold) and have never looked back. I use Baker’s Joy; works like a charm every time! Thanks Marsha! I just started having trouble getting bundt cakes out of the pan. I was embarrassed that they would come out in chunks on the top. Tried greasing and flouring and other spray products. I remember reading your post and bought Baker’s Joy the last time I went shopping. It worked perfectly. I had to write and thank you. Use Joy cooking spray, it has oil and flour mixed. My cakes drop right out when I flip the pan. Somehow this cake didn’t turn out for me. The flavor was terrific, but the cake was heavy as a rock. I followed the recipe, so I don’t know what happened. I wonder if the fact that I used a moist cake mix, which probably already had pudding like stuff in it, made the cake just too heavy. Also, I made half of the frosting and had plenty. Frosting recipe was very good–not too sweet. This is a heavier cake, as bundt cake’s are…but, not as heavy as a rock. The problem is the likely the moist cake mix because the cake is getting extra pudding. It could also be an altitude issue if you live above 3,500 feet. If this is the case, you would need to add 1 Tbsp of flour to the recipe and an additional 1 Tbsp for every 1,500 feet above that. I’m glad you enjoyed the flavor of the cake and the frosting in spite of the heaviness. Thank you for your comment! Quick question – do you use fresh lemon juice or store bought lemon juice? Either one works great, the fresh always seems to have a little better flavor though. It looks like delicious even though I never tried it yet.??????????? ?and still hoping that I could taste it so I could tell if its delicious or not.???????????? I made the cake twice. I have been making the chocolate version for about 30 years, since I was a teen, always perfect. When I was introduced to Nothing Bundt Cakes my eyes opened to a new possibility, Ive been hooked ever since. I made the lemon version twice. The first time with a cooking spray with flout in it. Almost came out, but the frosting would have covered it. The top was highly carmelized, could this be due to the natural sugars in the lemon juice? The second time I only used a regular cooking spray because that is what I use for the chocolate and the receipt did not say “grease and flour” and only half came out. Both were very tasty and I liked the lemon juice addition. Would a lemon extract work or taste tinny? I will go back to the nonstick with flour and try again tomorrow. I haven’t tried it with lemon extract because I am not a fan of the taste. I have thought about trying this cake with lemon oil as a substitute for the lemon juice. I have found that the bundt pan I use does make a big difference in how the cake comes out of the pan. I’ve tried a couple of newer non-stick pans, but I keep going back to an old bundt pan I’ve had for years. It’s not a non-stick pan, but with the non-stick cooking spray it works like a charm every time. Greasing and flouring the pan should work as well. See my comment above about using shortening – not cooking spray. Also, you might like lemon emulsion if extract doesn’t work for you. I have used baking spray with flour in it and then also floured after spraying and it works every time with no messy shortening. Would this work for their mini bundts? I did mini last night (I usually do the full size one) and I ended up making a full size. The mini didn’t have that same dense pound cake feel. They seemed to light and airy for me. I lost the rich yummy part of this cake. I’ve had the same experience with trying to make mini bundt cakes. They lost their yummy dense texture, came out more like regular cake. I wonder if possibly lowering the baking temperature so it cooks slower would help? I love this cake and have made in numerous times. I spray with Baker’s Joy and it always comes out beautifully. Only thing, it falls to about half the size. What can I do? It falls to half the size?? Can you elaborate? Does it just fill up half of the pan? Erica, No the batter fills up the pan and it bakes up just fine. But while it cools, it falls. This is exactly what happened to my TWO attempts to make this cake. I thought my first fail was something I had done but the second cake did exactly what Susie above says. It comes out of the oven looking great then during the 20 minute cooling in the pan, the cake completely goes flat. It ends up being a rubbery tube about 2 inches tall. SO sad. Also, I should point out that I used a Betty Crocker mix the first time and a Duncan Hines the second time, with the same bad results. I followed the recipe exactly as written. I know my oven is fine because after the two cake fails, I made (from scratch) chocolate cupcakes and they turned out just fine. I’m so curious as to why this would happen. I am so sorry this happened to you! It is hard to know what can cause things like that. There are lots of different culprits – expired ingredients, different altitudes, and oven temperatures can all contribute. I wish there was a “liked it” button. This is a really good cake, but it’s not the same as the Nothing Bundt Cakes one. This recipe has the right texture, but there needs to be more lemon flavor to be a copy cat recipe. This recipe tastes best when refrigerated. I copied this review from my Pinterest one where you could pick “Loved it” or “Not for me” and forgot to edit. The cake is really good, just not quite the same for me. I’m toying around with brushing on a lemon flavored simple syrup to see if that fixes it for me. Britta – I have added a tsp of lemon flavoring to the batter. I thought the same thing. BEST LEMON CAKE IVE EVER HAD!! I made this for my sister in laws birthday and everyone LOVED it. It is so moist it practically melts in your mouth. I made a cream cheese glaze to go with it. Mm mm good. I will absolutely be making this cake again. And again. And again. This cake looks amazing. I bought a bee hive cake pan for an upcoming party. It came with a lemon cake recipe but it wasn’t quite right. I was thinking of trying this be but I am wondering if it will hold the shape of the beehive and the little bees that are part of the mold. What are your thoughts? I think it definitely would work. It holds the shape of the bundt pan perfectly. Good luck! I’m going to make this next week and I have a few questions. If my cake mix has pudding in it already, should I not use the additional box? I was also thinking of using a couple of drops of lemon essential oil instead of the lemon juice. Do you think that would be a mistake since there would be less liquid? Hi Jessica, yes – still use the pudding even if the cake mix has pudding in it. I think using the essential oil will be fine. I would put the couple of drops of essential oil in a 1/4 cup measuring cup and fill the rest of the cup with lemon juice or water. Using lemon juice will make your cake really lemon-y. It will be delicious! I knew there was another question- The white chocolate chips. The recipe says they’re optional, what do you really think? Is it better to use them or not? I like to use them because I never have regretted using chocolate 🙂 But some people like just the pure lemon flavor so it’s totally up to you! Great taste, I will make again. But….. I don’t think it is nearly as good as Nothing Bundt cakes. The crumb/texture is way off comparatively speaking. Perhaps its the cake mix? I was shocked that even with 4 eggs, oil & sour cream, it was dry comparatively speaking. I ended up making a lemon syrup/glaze (poured over the cake) before frosting it. This helped but as I mentioned, the texture just wasn’t the same. Tried your recipe and I had to write and say thank you. I followed your recipe as written and it came out perfect. I used cooking spray and it came out of the pan cleanly. And it is light and moist and is just as good as the original…..next up is the white chocolate raspberry!! Thank you for your nice comment! So happy that you liked the cake and that it turned out so well for you. Let us know what you think about the White Chocolate Raspberry! Hello!! Do you have a recipe similar to this that doesn’t use cake mix? I make everything from scratch and don’t like to use anything store bought or pre-made. I don’t mind using the pudding mix, but I would like to avoid the cake mix. If you could help me out that would be great!! Thanks!! This one is made from scratch but it is a coconut cake, not lemon… https://www.favfamilyrecipes.com/coconut-cream-cake-with-coconut-cream/ You could probably make some changes to it to make it a lemon cake like this one here. Hope this helps! I use the lemon cake recipe from grandbaby cake website….yummy with a capital him! Loved the Lemon Bundt cake but tried my version by adding a cup of lemon pie filling. I added it by pouring about 1/3 of the cake mix into prepared pan then added about 1/2 cup of lemon pie filling -the added some more cake batter and swirled the mixture lightly -then put the remaining lemon pie filling and the remaining cake batter. Followed recipe baking instructions. Refrigerate over night. Tastes delicious and refreshing. Tried this cake today. First I want to say that my family LOVED it. It really doesn’t taste like the Nothing Bundt Cake lemon, but it has already been requested for a birthday cake and to take to my husband office. I will say that the icing recipe makes way too much and it was too sweet and not thick enough. I didn’t add any more powdered sugar to thicken it more as it was already super sweet. I think I would cut it in half and still have plenty. Thanks! If you think this recipe is going to taste like the lemon cake from Nothing Bundt Cake, you will be sorely disappointed. I made this last night, and it is not even close. It is ok, but neither the cake nor the frosting is anything like Nothing Bundt Cake. I love your chocolate cake recipe. I’ve made it twice and it’s a hit. I want to do a lemon raspberry. If I follow the recipe for the lemon one how would you do the raspberries? Thanks for the lemon cake recipe, it was the best! OMG! I’m a Nothing But Bundt addict and someone pointed me to this recipe and so I tried it out and WOWZA! It was absolutely perfect, dense, moist and delicious. LOVED the white chocolate pieces in the lemon cake! I need some practice frosting the cake but otherwise, it was a total winner! Printing this for future use for sure! I made this lemon cake this past weekend. It was delicious! What size bundt pan do you use? We used the standard 10-cup (about 9 1/2 – 10″) bundt pan. Hope this helps! What an AWESOME recipe! This came out (in my opinion) exactly like an NB cake! Thank you so much! So glad you liked this recipe! Isn’t it PERFECT for SPRING? The recipe was good – cake was very moist with an awesome texture. However, I was a little disappointed in the “lack of lemon” flavor in the cake. So, doing this again, but adding some zest and a bit more juice to it. However, Thank You for the recipe! 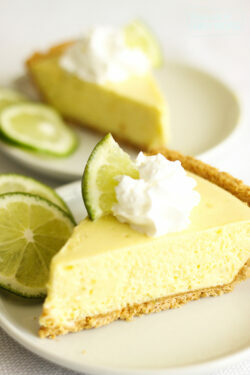 Great idea to add more lemon zest to kick up the lemon flavor! I’m sorry to say this recipe failed several times for me, and I am an experienced baker. The cake collapsed when cooling and was a gummy mess inside. Nothing like Nothing Bundt. We are sorry this didn’t work for you! We honestly can’t figure out why it works for some people and not for others? What brand of cake mix did you use? For easy and perfect removal of a cake from a Bundt pan every time, you need to prepare the pan using pan grease. Mix equal amounts of Crisco shortening, vegetable oil, and all purpose flour well with a mixer. Brush it inside of Bundt pan well with a pastry brush. After baking, let cake sit for a couple of minutes until cake begins to pull away from the pan, then invert onto cake plate. Perfect release every time. Pan grease can be stored in frig. 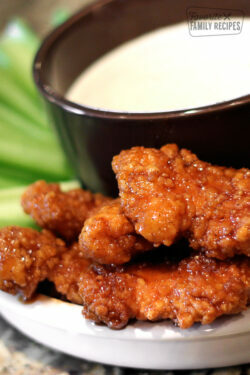 This recipe is awesome! I think it was pretty darn close to Nothing Bundt Cakes’. 5STAR!!!.. I replaced sour cream with lemon flavored yogurt. And, halved the frosting recipe. Thank you for the s stars!!! So glad it worked out for you– and AWESOME idea to use lemon-flavored yogurt! I am totally doing that next time! Do you have recipe for strawberry nothing bundt cake? Not yet, but we do have a delicious Strawberries and Cream Cake! Click here for the recipe. So, do I make the pudding or just put the dry mix in? You just add the dry mix. Hope this helps! What kind of “oil” do I use? Canola oil or coconut oil should be fine! I tried your recipie this weekend but before I added the egg whites to the cake batter , it was really thick. It took too long to cook (an extra 30 min) and it still wasn’t done right. What did I do wrong ? I am so sorry this recipe didn’t turn out for you! It is hard to say without seeing it what may have gone wrong. So many factors can contribute to a recipe turning out differently than how we make it – altitude, brand of ingredient, expired ingredients, measurement discrepancies, etc. I found this recipe in October 2018, made it twice and both times, during cooling, the cake collapsed. It came out of the oven lovely, and after about 10 minutes had sunk in half. I used freshly purchased ingredients and two different brands of cake mix. This is soo similar to the Nordicware Bundt recipe for the chocolate cake, but increases the oil from 1/3 c. to 1/2 c.
I’m so sorry the cake didn’t turn out! I’ve made this cake many times and I’ve not had that experience. It must have needed more cooking time if the cake sunk. I live at an elevation of 4600′ – is your elevation higher or lower than this?